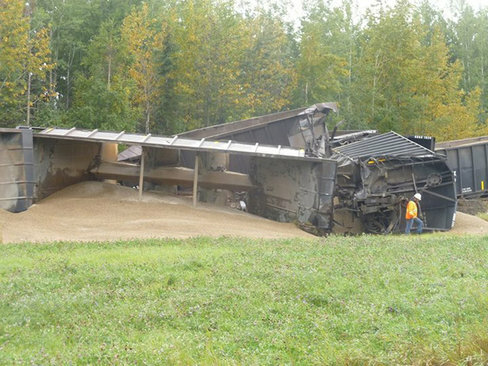 An eastbound Canadian National Railway train derailed just after noon September 9 near Cherhill, about 100km northwest of Edmonton, Alberta (QMI Agency). Eight cars filled with gravel fell off the tracks and 4 tipped over, spilling their loads on and around the tracks. It is not known how long the main line was shut down to clean up the mess. CN has had a string of derailments in Alberta during the past few months; see CN Railway Derailments, Other Accidents and Incidents for a partial list of these. CN intentionally does not report many of its derailments in Canada and the United States. ~ by railroaded on September 10, 2014.